She is one of the main characters in the manga series Nisekoi. She is shown to have a crush on Raku Ichijou, the male protagonist of Nisekoi, and is also the only girl that Ichijou openly has feelings for. Onodera is discreet, innocent, and slightly timid. She is very kind, she takes care of Ichijou when he is wounded or ill. Generally, she opts to think carefully before acting, as seen when she stalls her confession to Ichijou in consideration that he may have feelings for Kirisaki. In confrontation with Ichijou, Onodera lacks confidence, initially needing encouragement from Miyamoto to attempt confessing her love. 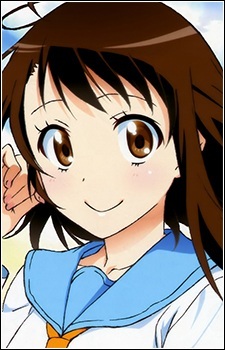 Onodera works well with her classmates, possessing close friends and being the most popular girl for the boys before Kirisaki transferred and after Kirisaki and Ichijou allegedly began dating. Both Kosaki and Ichijou are completely unaware that the feelings they hold for each other are mutual. Like in many average fictional love stories, these two try not to show their feelings to each other. She loves Raku because he is kind and caring. Just like the other girls who like him, she can be jealous as well but not to the point of having bloodlust. She often worries/wonders whether Raku and Chitoge's "fake relationship" is actually developing into something more than just that. Chitoge and Onodera have a really trusting relationship. It can even be considered that they are best friends since Chitoge only tells her problems to her (except in some cases, Raku as well). Despite her knowing that Chitoge and Raku are only pretending to date, she at times can't help but be suspicious of their relationship. It is revealed at the end of the manga that she is in fact the girl that Raku promised to marry as a child. They both confess that they have had feelings for each other since middle school; however, Raku also tells her that he has fallen in love with Chitoge.